As an Etsy shopkeeper, I adore my customers and always like to send them a thank you gift with each purchase. This post is an idea I had for a thank you gift that is easy to make, uses cast-off magazines and is nice and light so as to not add weight and postage costs to decrease profits. 1 1/2 inch circle punch (or any other shaped punch that you like). I like to use pretty lifestyle magazines and garden magazines but you can use whatever magazine suits your personality and taste. Then what you do is look at the different pages and use your punch to "audition" different textures, pictures and design elements. This is the reason I like to use the squeeze style punch - it makes it easy to see exactly what your sticker will look like. You can find potential sticker material in pictures of fabric or photos of jewelry or you can punch out different words or phrases. I've punched circles of just about everything. It's amazing how different one little element by itself will look. Here are a bunch of circles that I punched out. Aren't the colors and textures so pretty? Here are the stickers coming out of this nifty little machine. I like to put a few stickers in a little cellophane envelope along with my business card - the crystal clear package looks so pretty. 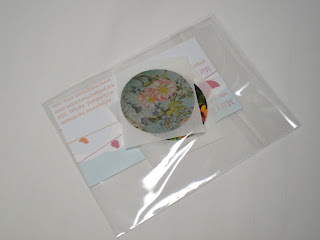 You could also make a little envelope from a piece of recycled paper. That's such a great idea! I'm going to have to look for one of those sticker machines! Hi Mary, I know of you through Cosa Verde as well, and I love the story of your shop name! 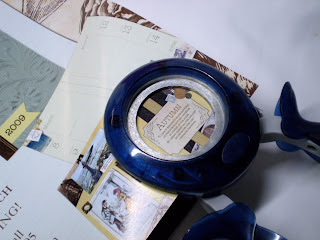 I linked to this tutorial from another blog, and I was so excited I went out last night and bought the Xyron sticker maker - I'm going to stickerize everything! Thanks for putting together this tutorial! Hi, I found you through your post in the Etsy forums (a thread about promo ideas). This is a great tutorial and a nice idea for promos. Love it! 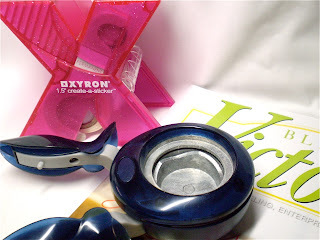 Wondering how expensive the Xyron tool (machine?) is. Something you would just find at Michaels or any regular craft store? 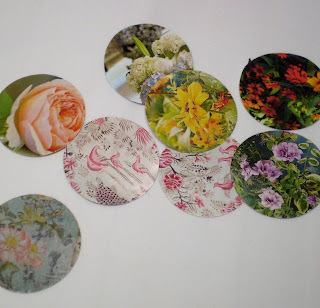 Anyhow, lovely idea and like Allie said previously, makes me want to stickerize everything too! Krissy - Glad you like the idea! I bought my little Xyron machine for about 8.00 at our Wal-mart here in Goodland, KS (our only choice, unfortunately). 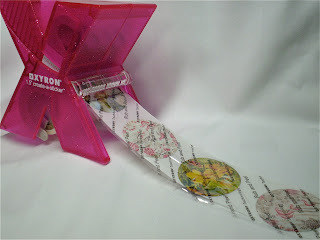 The Xyron comes equipped with your first roll of sticker making stuff, and you can buy refills. One roll makes an awful lot of stickers. I'm sure Michaels or Joanns have them too. Found you through the etsy forums also! really cool idea and love that it is inexpensive. think i'm going to have to go hunt this down today! thanks! This is a fabulous idea! The stickers look so neat and sweet! Thanks for sharing! !